In this episode, the Totpod crew (Jimmy, Jason, and Jessica) let the cat out of the bag and give you all the scoop, the inside track, on all of the seedy and shady conspiracies that exist and some that don't just yet. Some conspiracies include JFK, Macklemore, Roswell, Google Maps, and so much more. Enjoy! You can just call us Barry Manilow, because it Looks like we made it! 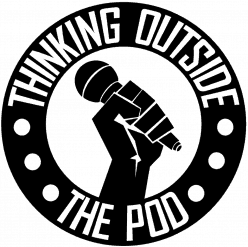 The end of an era, Thinking Outside The Pod: Season 2: Electric Boogaloo has come to an end. For the momentous occasion, Jimmy, Fisher, and Jason don’t really do anything different than any other episode – they discuss the record setting Powerball winners, the failure of Jimmy’s brilliant Kickstarter social experiment, Oculus Rift and Virtual reality, Netflix, and the evils of Corporate America. So stay tuned for season 3 as we continue to try and make sense of this crazy world and last but not least thanks for listening.